Six-year-old Miranda and her three-year-old sister Luciana came to Casa Pacifica after being removed from their grandmother’s home due to severe medical, social and emotional neglect. Their mother was an active substance abuser and had abandoned them; their father was an absent parent. Miranda had cerebral palsy and spastic quadriplegia and could barely walk. Both girls were admitted with head lice and dirty clothing, able to communicate only in Spanish. The children were not toilet trained, nor were they capable of independent living skills such as washing their own hands, dressing or eating with utensils. Casa Pacifica staff quickly assessed the girls’ needs and put a plan into action. In addition to Miranda’s medical needs, there also were behavioral and emotional challenges. She was delayed in the areas of socialization, language, spatial concepts, counting, reading and object recognition. Miranda was easily frustrated and resorted to head banging and biting to try to get her way. Luciana’s behaviors included frequent tantrums and poor impulse control. Doctors on campus examined the girls’ teeth, eyes and overall health. 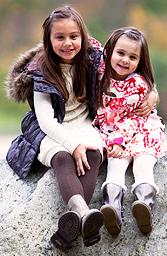 Luciana was diagnosed with borderline anemia and a special diet was prepared to increase her blood iron. With Miranda, more intensive procedures were needed. We needed to begin to straighten her legs through a medical program of serial casting. We asked for a court order authorizing the procedure and each week doctors would put new casts on both legs. Child care workers on campus assisted her in a daily exercise program and she received off-campus physical therapy several times a week. Preschool activities enabled the children to learn new skills quickly. Both girls began toilet training and Miranda learned to use scissors and button clothes. Playtime often included acting out daily living skills that would help them become more independent. With staff members speaking both Spanish and English, the children quickly began to feel safe in their environment and started to thrive. After three months, both Miranda and Luciana were fluently bilingual, exhibited age-appropriate social skills, were toilet trained and were able to dress themselves and attend to their own hygiene needs. The head banging and biting behaviors stopped completely and the daily tantrums diminished as the girls learned they could ask for what they needed. Miranda’s casting was successful and she began to walk with much better balance and increased muscle strength. Through testing, the girls were found to be very bright. They learned colors, numbers, letters and age-appropriate skills. Miranda transferred to the kindergarten class at Casa Pacifica during her last three weeks of shelter care. One month after Miranda and Luciana had been removed from their grandmother’s home, their social worker located a bilingual therapeutic foster home for them. The girls were visited often by the foster parents and were taken off campus to visit what would become their new home. Today, Miranda and Luciana are doing well with their foster family. Their mother and grandmother visit occasionally. Their court case is pending. We are very proud of the immense progress both children made during their time at Casa Pacifica. Note: Miranda and Luciana’s names and photo have been changed to protect their privacy.